While USD was losing power due to the election results, AUD was weakening as well as the result of weak Consumer Confidence in Australia. The support rests in 0. 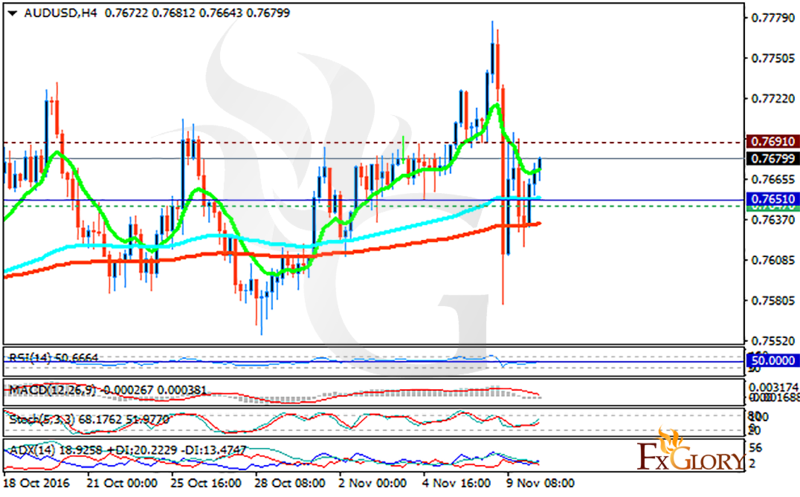 76470 with resistance at 0.76910 which the weekly pivot point at 0. 76510 is located in between the lines. The EMA of 10 is moving with bullish bias and it is located above the EMA of 100 and the EMA of 200. The RSI is moving in the 50 level, the MACD indicator is in neutral territory and the Stochastic is showing upward momentum. The ADX is not showing any clear signal at the moment. Short positions are recommended targeting 0.7625.